Consulting, design, and implementation of innovative integrated 3D solutions for product development, sourcing, and production. Optimization of the relevant business processes and technical integration of the CAx-Systems systems into the existing IT environment. Helbling offers you in-depth experience gained from the projects it has implemented successfully for renowned industrial companies. Thanks to our proven reliability and professionalism, many of our clients choose to work with Helbling on a long-term basis. Our employees have considerable expertise both in the area of CAx systems and in using data management and business management solutions. A well designed PLM solution, properly implemented, gives our clients a clear competitive advantage, which is especially reflected in reduced development and production times (time to market), lower product costs, and higher quality. 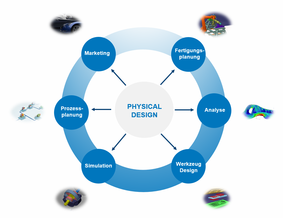 Our solutions are based on the Dassault Systèmes’ Product Lifecycle Management (PLM) philosophy, the objective of which is to cover the entire value chain from the initial idea right through to the finished product by means of one integrated 3D system. CAx, complemented by data-management systems from the same development company, represents the perfect solution to this requirement.